It wasn’t looking good for Judy Perkins. Her breast cancer had come back with a vengeance after a 2003 mastectomy and she had big tumors in her chest and on her liver. But an experimental new approach that combines new immunotherapy drugs with a tailor-made therapy to boost her own immune system pulled Perkins back from the brink of death. 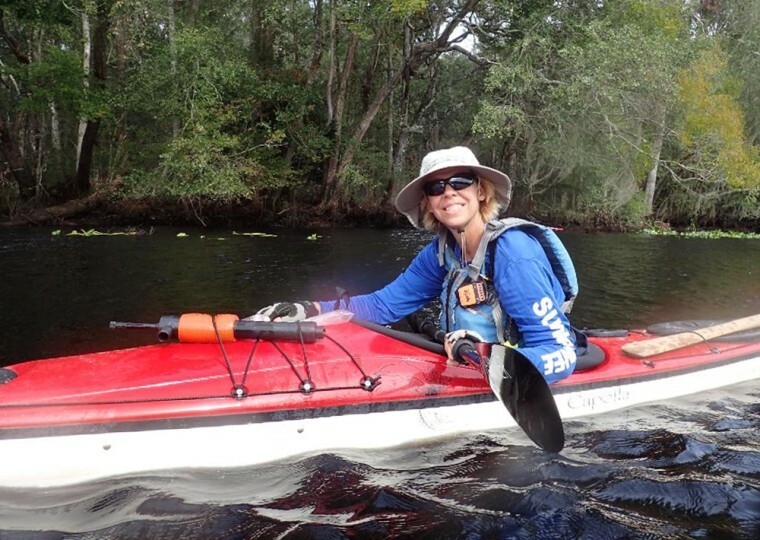 She’s just completed a 1,200-mile kayaking trip around the state of Florida and is looking forward to decades more of life. “I hit the jackpot,” said Perkins, who is now 52 and cancer-free more than two years later. Perkins really is lucky. The intensive, tailored approach only helps 15 percent of the patients who tried it, said Dr. Steven Rosenberg of the National Cancer Institute, who led the team that treated Perkins. But Rosenberg, who has dedicated his career to finding a way to harness the body’s immune system to fight cancer, think her case has taken his quest a big step forward. “We are getting better all the time,” said Rosenberg, whose findings are published in the journal Nature Medicine. What his findings mean, he says, is that oncologists have to recognize that cancer is unique to every patient, and that treatments must reflect that. “We have to develop a new drug for every patient,” Rosenberg said. Perkins’ immune system was already trying to fight off the tumors that had spread across her torso. What Rosenberg aims to do is find and amplify the immune system cells that are doing the best job of it, even as they are overwhelmed by the cancer’s spread. The team took samples of her tumors and sequenced their DNA. They also sampled tumor infiltrating lymphocytes, the immune system cells that were stuck to the outside of the tumors. After finding the genetic mutations that allowed the tumor cells to take over their victim’s body, Rosenberg’s team chose the immune cells that were latching onto those particular mutations most effectively. “It’s a whole different way of thinking about cancer treatment." Those cells they grew outside Perkin’s body and then re-infused back into her system. They also dosed her with the immune-boosting drug interleukin 2, as well as with Keytruda, one of the newer immunotherapies that have been shown to have remarkable effects in certain cancers. And she went through one last round of chemo to give the new lymphocytes room to take over. “The patient had these large, almost tennis-ball-sized lesions, one growing almost through her chest wall,” Rosenberg told NBC News. “She had tumors throughout her belly and lymph nodes, and everything disappeared when we targeted four of the mutations that her tumors were expressing," he added. Perkins could feel one big tumor in her chest and she knew when the treatment started working. “That tumor I could palpate with my fingers and it started to get softer and shrink,” she said. Targeted cancer drugs are formulated to match specific mutations seen in specific cancers. But Rosenberg said he has found that tumors in one patient have mutations that are different from those seen in other patients. And while the new immunotherapy drugs help the body's immune system recognize tumors, they only work in a small percentage of patients. Rosenberg's team often takes on last-ditch cases — people with months to live, whose cancer has come back again and again despite multiple treatments. He’s treated patients with liver cancer, bile duct cancer, melanoma and other cancers. Only a few of them live, but those cases are spectacular. Perkins knew this when she signed up for the trial. Perkins, who lives in Port Lucie, Florida, sent two friends with breast cancer to Rosenberg’s lab and both of them died despite the treatment — one of them with severe side-effects from the treatment itself, she said. Rosenberg is quick to say the approach is not ready for commercial use, but he notes that CAR-T, a similarly personalized cancer treatment that works in blood cancers, that has been commercialized by companies including Kite Pharmaceuticals and Gilead Sciences. CAR-T only works in blood cancers, Rosenberg said. A different tactic is needed for solid tumors, such as breast cancer. And even though it is very expensive and very complicated, CAR-T can be successful, he noted. “It’s a whole different way of thinking about cancer treatment,” he said. Cancer specialists not involved in the experiment called it a major advance. Dr. Laszlo Radvanyi of the Ontario Institute for Cancer Research in Toronto described it as “an unprecedented response in such advanced breast cancer”. “We are now at the cusp of a major revolution,” Radvanyi wrote in a commentary. “This particular technique is highly specialized and complex, meaning that it will not be suitable for many people, but it is exciting because it shows how the immune cells already inside cancers may be switched on and made to work better,” said Dr. Peter Johnson of Southampton General Hospital in Britain. As for Perkins, she says she is no longer a “professional cancer patient”. “I got back to doing what I like to do,” she told NBC News. The cancer forced her to drop plans to start nursing school after ending a career as an engineer. She had also started a “bucket list” of adventures and will continue ticking off experiences. “We went rafting down the Grand Canyon,” said Perkins, who has two sons and two stepsons with her husband.